Seatings at 5:00 p.m. and 7:30 p.m. 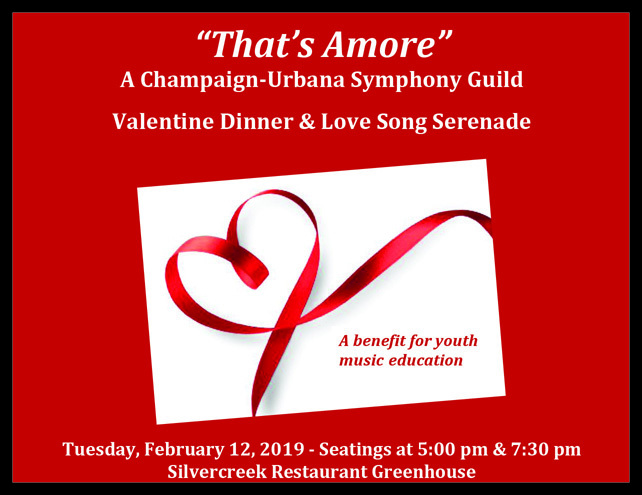 The Guild of the Champaign-Urbana Symphony Orchestra invites you to enjoy a romantic evening of dining and enchanting love songs performed by soprano Dawn Harris, baritone Ronald Hedlund, cellist Barbara Hedlund, and pianist Rick Murphy. Dinner includes salad, a choice of entree, dessert, and beverage. Cash bar available. Reservation form with menu choices available here. Your ticket includes a $40 charitable contribution to benefit the CUSO’s youth music education programs and in-school concerts. Paid reservations are required by February 1, 2019, and may be made by calling the Champaign-Urbana Symphony Orchestra office at (217) 351-9139 or by mail using the reservation form.